BBC Sport has a series of videos introducing wheelchair curling and also the members of the wheelchair curling team. 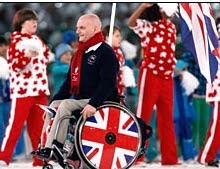 Michael McCreadie, skip of Team Great Britain, was the only curler to be given the honour of carrying his nation's flag at the Opening Ceremonies of the Vancouver Paralympics. In the video below he gives a full explanation of how wheelchair curling is played, ending with encouragement for people to come out and try the sport. There's lots of people who will help, he says, concluding:"Give me a call and I'll turn up also." One interesting note from the video: they edited in the last rock thrown by Frank Duffy from the Torino Games, where Great Britain had an open hit to win gold. It starts at 2.00 into the video. Other videos including video profiles of Team GB curlers, can be found HERE.